It is stunning how social movements were able to mobilize the masses to protest against democratic backslidings, often combined with demands for better governance. The openMovements series invites leading social scientists to share their research results and perspectives on contemporary social struggles. CrossedArms.Y’en a marre. All rights reserved.Since 2010 protests and riots have exceeded the rate of civil wars fought in African states, as the Armed Conflict Location and Events Dataset (ACLED) Databank reveals. One central reason for massive uprisings are presidents who are desperately clinging to power. Heads of states in Burundi, Senegal, or DR Congo – to name just a few – have tried to extend their terms, either by a constitutional amendment or by other (non-)institutionalized means. As the constitutional law is often not well known within the population (similar to other world regions), it is stunning how social movements were able to mobilize the masses to protest against those democratic backslidings, often combined with demands for better governance. 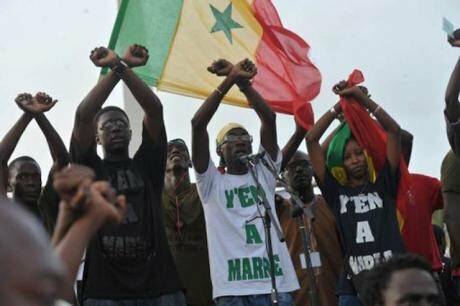 Two youth movements in West Africa have gained massive media attention – Y’en a marre in Senegal and Balai Citoyen in Burkina Faso. Some of them criticized the lack of future visions of those movements: others were not willing to share the monopoly of the fight. In both cases those youth-led movements temporarily contested with other opposing forces but were not able to unite them in the long-term. Single groups even refused to take part in their struggles despite common goals. Some of them criticized the lack of future visions of those movements: others were not willing to share the monopoly of the fight. Nevertheless, those new movements were able to successfully mobilize the youth – and the media to report about their protest. 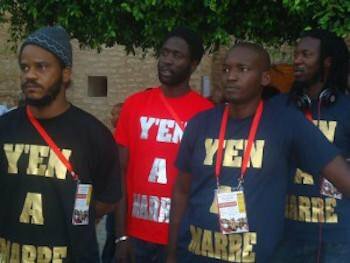 In 2011, Keur Gui (a well-known hip-hop group in Senegal), Fadel Barro (a journalist) and other rappers from the suburbs in Dakar raised their voices in Senegal to claim that they were “fed up” with the bad governance of the president and hence were launching the movement Y’en a marre (engl. “We are fed up”). With very limited financial means and little experience in the political sphere, these leaders successfully mobilized the youth – a generation that usually positions itself far away from politics. At first, Y’en a marre independently called for protests to denounce bad governance practices. By using privately owned cars and renting sound systems, the leaders based their contentious actions on their dense personal network of friends, colleagues, and supporters in Dakar. But when in June the Senegalese president Abdoulaye Wade announced changes to the constitution in his favor, many different groups ranging from university students, human rights organizations, and opposition party leaders took to the streets. This led to a massive uprising on 23 June 2011 and the formation of a rather loose alliance named Mouvement du 23 Juin (M23) in the aftermath of which Y’en a marre participated. They had three main criticisms in common – the constitutional amendment, bad governance, and oligarchic rule under Wade. Their manner of resisting non-violently and showing responsibility by cleaning up public spaces after the protests, convinced them. Esprits. Y’en a marre. All rights reserved.The more established opposition leaders were skeptical at first because rappers are seen as a marginalized, stigmatized group in Senegalese society. In their eyes they were hardly adequate figures to lead such a civic revolt. But after their initial protest campaigns, their manner of resisting non-violently and showing responsibility by cleaning up public spaces after the protests, convinced them, built trust, and prepared the pathway to a successful M23. Y’en a marre dominated the national media discourse due to their newness, communication skills, and the discontent of media bosses under the Wade regime, so that some even reported in an unprofessional, rather supportive manner. They used innovative protest tactics such as urban guerilla poetry within protest songs in which they directly addressed Wade by calling on him not to force his third term - “Faux! Pas Forcé”. When radio channels refused to play their songs, they got distributed via mobile phones and even became ring tones. Internationally, Y’en a marre was often pictured as the leading force in front of the masses, letting them speak out louder than other popular leaders. This unequal media attention led to a split between the actors and a dissatisfaction that lasts until this day. The strength and weakness of M23 was their network structure that allowed every organization to enter without the need to label their protest activities as part of M23. Trade unions in contrast played a minor role. The large confederations decided to stay neutral: even the more politicized Confédération des Syndicats Autonomes (CSA). The reasons are mainly their self-understanding as corporatist advocates of particular interests and their division during Wade’s rule. Nevertheless, Individual members participated in the protests. Unequal media attention led to a split between the actors and a dissatisfaction that lasts until this day. The turning point of the struggle came after the decision of the Constitutional Council on 27 January 2012 that legalized the candidature of Wade for the upcoming presidential elections. After repressive force was used to dissolve the activists’ blockades, Y’en a marre called on their followers to register for the elections. At the same time, the main opposition leaders left M23 to start campaigning for the upcoming elections, so that common protest calls ended on that day and mobilization decreased. On 25 March 2012, Macky Sall as the united opposition candidate won the election in the second round and became president of Senegal. Only two years later Blaise Compaoré, the incumbent president of Burkina Faso, aimed at changing the constitution in his favor to rerun for office. Interestingly enough, Smockey, a popular musician, together with Sams’K Le Jah, a well-known radio moderator, became the frontmen of a new movement aimed at cleaning up the corrupt system by acting as a citizens’ broom, calling themselves thereafter Balai Citoyen (engl. ‘Citizens’ Broom’). Behind the scenes, journalists from opposition newspapers supported the movement. Right at the start, Balai Citoyen focused its communications on the press. They distributed their frames and collective actions via radios, newspaper, and social media channels – and received a high media echo that in turn attracted ever more (young) people to follow them, creating a huge pull-effect. It is quite remarkable that those musicians were the leaders, given the lively and highly politicized scene of civic opposing forces in Burkina Faso’s capital Ouagadougou, on whose fights the new struggles were based. One example is the Collectif des organisations démocratiques de masse et de partis politiques (CODMPP) of human rights organizations, trade unions, and political parties that was initiated in the aftermath of the political assassination of Norbert Zongo in 1998, a critical investigative journalist in whose assassination the government was mired. Annually, those protest actors reminded the Burkinabe population of the impunity involved both on his memorial day and on that of former president and revolutionary role model Thomas Sankara alike. They lay flowers on these graves and published declarations. Their leaders came from the Confédération Générale du Travail du Burkina (CGT-B), a union confederation whose demands went well beyond working conditions, and the oldest human rights organization, Mouvement Burkinabé pour des Droits de l’Homme et des Peuples (MBDHP). Those organizations worked for a political alternative, not just another swap – a changeover of power. Those organizations worked for a political alternative, not just another swap or pendulum swing – a changeover of power. Balai Citoyen in contrast primarily aimed to begin with changing the president in power. As a consequence their struggle can be at best be described as resistance against the changes to Art. 37 of the Burkinabe constitution to allow Compaoré to run for another term in office and to create a senate expanding his power base. The established anti-Compaoré forces criticized the lack of an alternative future vision beyond Compaorés’ overthrow. Balai Citoyen in turn challenged the routinization of their contestation as well as their approach for being too theoretical, intellectual, and old-school Marxist. ClosedFist. Balai Citoyen. All rights reserved. Between 27 and 31 October 2014, when the vote of the National Assembly on the constitutional change was appointed, the central episode of an eventful protest series happened: diverse organizations called on their members to become active but did not participate with their banners, names, or slogans. On 29 October 2014, trade unions went on a general strike against the living and working conditions, civil society coalitions called for an occupation of the streets, and Balai Citoyen organized sit-ins to resist. It is striking how those temporarily and spatially related collective actions became a powerful resistance despite blocked alliances at the formal level. Those contentious collective actions were mainly related by their framing as an “anti-Compaoré front” which led to the resignation of Compaoré on 31 October 2014. It is striking how those temporarily and spatially related collective actions became a powerful resistance despite blocked alliances at the formal level. In both countries, new leaders from the music and media scene of the capitals functioned as mobilizers of the young, urban and male activists. Those new leaders offered a method to distinguish themselves not only from earlier struggles but more broadly from former generations. Tired of routinized protest tactics such as memorial days in Burkina Faso, or letters of complaint to foreign embassies in Senegal, they placed street struggle in the forefront of their efforts. 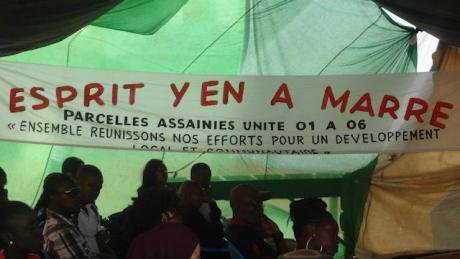 In contrast to established civil society leaders, the leaders of Balai Citoyen and Y’en a marre did not position themselves within a particular political course despite opposing the incumbent president and his politics. So it was easier for participants to identify with their claims that were broadly framed but locally explained with reference to peoples’ everyday lives. Additionally, both used merchandisable symbols and catchy slogans that rapidly created a collective identity comparable with pop star fandom movements. Young people were able to get involved easily by starting to take part in those movements without paying high membership fees, overcoming institutional hurdles, or having preexisting connections to the intellectual scene. Claiming yourself a Y’en a marrist or a Cibal/Cibelle, you automatically became part of the struggle. Claiming yourself a Y’en a marrist or a Cibal/Cibelle, you automatically became part of the struggle. T-shirts. Y’en a marre. All rights reserved.At the same time, those leaders were not completely new to the scene and could rely on their existing fan base. The Senegalese rap group Keur Gui had been popular among the youth as role models for a long time. Sams’K le Jah, the Burkinabe reggae musician, already in 2011 had called for the departure of Compaoré and become known as a result of his own radio show on Ouaga FM. Most notably their preexistent publicity and their ability to speak in front of masses as well as their close relations with the media facilitated the initial mobilization – and also a favorable media coverage. On top of that, they used social media channels as a tool to share their protest events and disperse sensational images which attracted even more young people to become part of this movement. By using social media channels for their communication, both movements gained more international attention, whereas former protest movements had been hampered by biased reporting in Europe and the US. Many foreign journalists took to these heroic youth narratives that showed scant respect for the role of political parties. Simultaneously, this transnational dispersion helped to put pressure on local media reporting, it forced elites to respond, and encouraged more young people who wanted to be a part of it. Even if the success of those new leaders was based strongly on the work of other leaders before them, the simplicity of their actions, words, and organization facilitated the participation of excluded groups such as the urban poor youth in Senegal and those who were not part of the Marxisant intellectual scene in Burkina. The media supported their mobilization if only because they preferred to report either on well-known personalities or completely new leaders – two combined assets that the leaders of Y’en a marre and Balai Citoyen could boast. Given the goal of removing the current incumbent to the presidency, these new leaders show more pragmatic motivations for the strategic alliances they are willing to make, whether it is with political party or civil society representatives. On the other hand, a tendency to fight over their discursive priorities and short-range future visions hindered closer alliances with more established civil society forces. It seems that those actors fear to give up their monopoly on the struggle to new actors and hence their control of the public narrative. In both uprisings, the new movements gained massive media attention which intensified the organizational concurrence. One reason is their newness of leadership, organization, and media tools. Another is their role: in contrast to the leaders of M23 or CODMPP, their predominant role has been to mobilize the people, merchandize a collective identity, and lead the masses. Their predominant role has been to mobilize the people, merchandize a collective identity, and lead the masses. In Senegal, the actors‘ dynamic is mainly marked by competition understood as a struggle over rewards for successful mobilizations. Here, the urban visibility and networks led to a biased media coverage that contributed to competitive relations by highlighting the role of the new leaders and enabling those leaders to have a far greater vocal impact. Besides that competition over discursive sovereignty, personal vanities played a key role, especially in the case of Senegal. At a certain point in time, many civil society leaders could plainly see that the rewards for the mass mobilization were unequally distributed. In Burkina Faso by contrast, the actors‘ dynamic is marked by a polarization understood as an increased ideological gap. With regard to their lack of organizational muscle, opposing forces mistrusted those new heads. Until today, they doubt whether those movements can offer a real alternative to neoliberal politics. In their view, the broad frames of Balai Citoyen that concentrated on the resignation of Blaise Compaoré were lacking concrete future visions. They were not convinced that the exchange of one neoliberal by another will solve the main problems Burkinabe society faces. Can an ‘alternance’ of this kind be the first step towards a genuine alternative or must it be a stabilization, preventing an alternative? Can an ‘alternance’ of this kind be the first step towards a genuine alternative or must it be a stabilization, preventing an alternative? The advantages of those movements when it comes to cross-movement mobilization – their simplicity and pragmatism – constitute at the same time their disadvantages for stable cross-movement alliances. The main forces with which they engage, especially in Burkina Faso, are opposition parties that they conceive as powerful but not trustworthy partners in the fight against the president. The motivations of opposition leaders are easy to deduce, as another term in office would postpone their access to an executive position. Their unity is based on an “anti-government frame” and not on common ideological grounds. This might be enough to mobilize the youth, but it is not enough to build the trust which is the basis for alliances in the long run. Rumors about financial or ideological support from external actors illustrate the existing mistrust among those old and new social movements. After many eventful protest episodes, it is essential for new movements to reflect on their own organization in terms of transparency, a key element for building trust, and critically discuss future options and visions with other opposition forces from civil society and the intellectual strata. The media discourse should be seen by new and old leaders not as a playground that needs to be conquered but rather as an open space that is dynamic, and one in which they can be engaged as one vivid voice among many others. This article is based mainly on thirty semi-structured interviews with movement and civic society leaders that were conducted by the author in Senegal and in Burkina Faso between January and March 2017 as well as on the analysis of protest calls and press conferences.